The Rev. 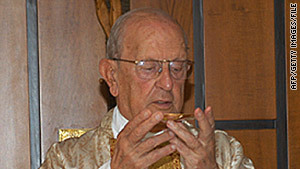 Marcial Maciel celebrates Mass in Rome, Italy, in August 2005. Legionnaires of Christ ask forgiveness for "reprehensible actions of our founder"
Rome, Italy (CNN) -- The founder of a Mexican Catholic order sexually abused minor-age seminarians and fathered three children with two women, the religious sect has revealed. The Legion of Christ order and its lay Regnum Christi Movement asked for forgiveness Thursday for "the reprehensible actions of our founder," the Rev. Marcial Maciel. "We express our sorrow and grief to each and every person damaged by our founder's actions," said a communique signed by the Rev. Alvaro Corcuera and 15 other Legion of Christ leaders. The abuse allegations surfaced in 1997. The Vatican started an investigation into Maciel's actions in 2004 and concluded in May 2006 that he was guilty of sexual abuse, the group said. "We had thought and hoped that the accusations brought against our founder were false and unfounded, since they conflicted with our experience of him personally and his work," the order's statement said. As a result of the Vatican investigation, however, officials at the Legion of Christ "reached sufficient moral certainty to impose serious canonical sanctions related to the accusations made against Maciel, which included the sexual abuse of minor seminarians. Therefore, though it causes us consternation, we have to say that these acts did take place," the group said Thursday. The Vatican, "mindful of Father Maciel's advanced age and his delicate health, decided to forgo a canonical hearing and ask him to retire to a private life of penance and prayer, giving up any form of public ministry," the communique says. Pope Benedict XVI approved the decision. Although leaders at the Legion of Christ knew of the abuse since May 2006, they kept it quiet until this week. As of Friday, Maciel's biography on the order's Web page merely said, "In May 2006, the Congregation for the Doctrine of the Faith invited Father Maciel to 'a reserved life of prayer and penance, renouncing all public ministry.' "
Maciel died January 30, 2008. Now, he told CNN en Español, "we have to recognize the facts as they are." Legion leaders acknowledged the delay, saying in Thursday's communique, "It's taken us some time to assimilate these events of his life. For many -- above all the victims -- this time has been too long and painful." In addition to sexually assaulting young seminarians, Maciel fathered at least three children, Thursday's statement said. The first Legionaries arrived in Spain in 1946, and the order established a center in Rome in 1950. In the 1960s, the Legion established itself in Ireland and the United States. In the 1980s, the order expanded into more countries in South America and Central Europe. The Legion says it recently began pastoral projects in Eastern Europe and Philippines.